When I saw this week’s word, I remembered my animation classes where we used “primitives” to begin our movies. I know all you 3-d guys know where I’m coming from. 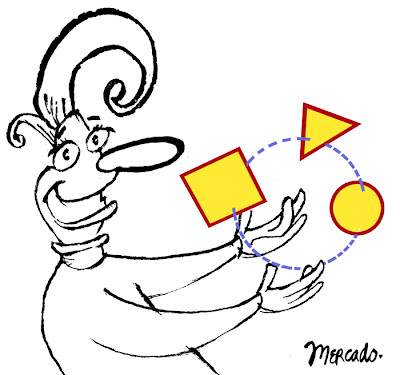 I wanted to combine the freestyle curving lines of the juggler with these geometric “primitive” shapes (the red and yellow things). Hey, if you didn’t know what a primitive was in animation, now you do. You’ve learned a new art term! Bet you can’t guess what movie I just saw recently that inspired me on this one. Maybe you can. Here’s a hint: it’s after a big gray guy with an extremely long nose. If you guessed “Horton Hears a Who”, you’re right! Have a good week everyone. The curving lines with the “primitives” create a nice contrast. Nice work! And informative too! Thanks for the comment as well.